Check Rates & Availability at Holiday Inn Express ORANGE BEACH-ON THE BEACH! Welcome to Our Hotel in Paradise Come enjoy our contemporary Holiday Inn Express Orange Beach - On the Beach hotel where everyday feels like paradise. You'll find white sandy beaches, warm breezes and the pristine blue waters of the Gulf of Mexico just outside our front door. We provide a name you can trust when visiting the great state of Alabama, and thanks to our reasonable rates, we're the place where you can "Stay Smart." 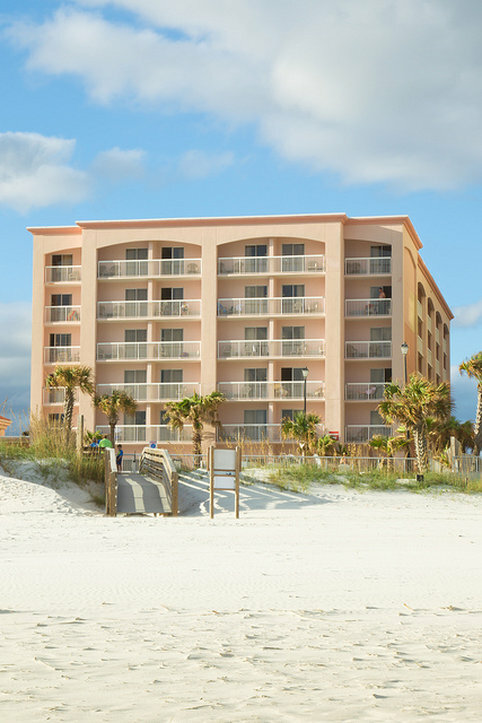 Our hotel is located in Orange Beach, AL and is on the shores of the Gulf of Mexico where guests can go deep sea fishing, parasailing or wave running. Visitors can spend the day visiting the Gulf Island National Seashore, shopping at the Tanger Outlet Center or enjoying a concert at the Amphitheater at the Wharf in Orange Beach. Our beach front hotel is also a great place for business travelers. With a convenient location off Perdido Beach Blvd, we are within driving distance of downtown Gulf Shores, AL and Pensacola, FL. Our facilities also boast a 24-hour business center, free Internet access and a 920-sq ft meeting space. Unlike other hotels in Orange Beach, AL, we are directly on the beach and offer an array of free amenities to guarantee a good stay, including a hot breakfast bar, a 24-hour fitness center and a heated, outdoor swimming pool and hot tub. Make the smart choice and book your reservation at our contemporary Holiday Inn Express Orange Beach - On the Beach hotel today. See you soon! Fresh Seafood and Live Entertainment. Elegant dining upstairs from Calypso's in Orange Beach Marina.